Join us for the opening of our Holiday Gift Show to view original works for sale by local and regional artists. Tread off the beaten path for your holiday gift needs with our inspiring and unforgettable selection of fine art, crafts, jewelry, accessories and more! Support local artisans and give something special to your loved ones this holiday. Enjoy festive food by Go Fish, cocktails, music and good cheer. 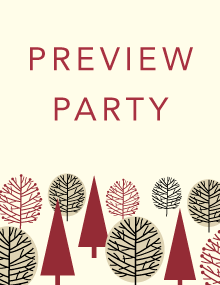 All purchases are tax-free during the Preview Party!